In this page programmers for Jupiter Card are described. I've added LED's which indicate DATA stream. These LED's are not in the pictures. 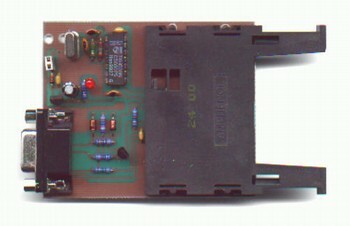 The original hardware and software PonyProg (which can be used for Jupiter Card programmer II) is presented in Lanconelli Open Systems. A SmartMouse oscillator is used insted of original circuit to prevent problems, which are announced by error message "Device missing or unknown device (-24)". The serial port of PC is used for connection. This programmer is compatible with so-called "Harpune" programmer. 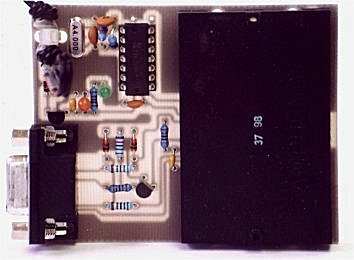 jupproga2o.bmp - layout of components of Jupiter Card programmer II. Jupiter Card programmer - version "SATHACK.cz"
The original hardware and software PonyProg (which can be used for Jupiter Card programmer for parallel port II) is presented in Lanconelli Open Systems. jupprogp2o.bmp - layout of components of Jupiter Card programmer for parallel port II. 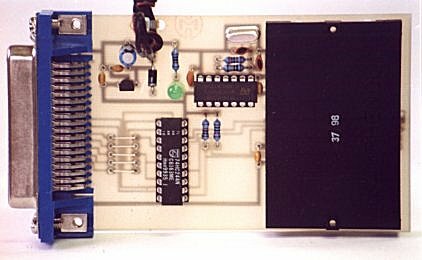 Programmers for Jupiter Card electronic circuit. Microcontrollers electronic circuits and schematics.